Coffee is good for more than just waking you up in the morning. Take a look at this list and find the perfect recycling tips and tricks so you can enjoy your coffee again – even after you’ve finished sipping your morning cup of Joe! You’ll never throw away your used coffee grounds again after seeing just how many things you can do with them! If you find you aren’t drinking enough coffee to be able to utilize the old grounds, then you can often pick up bags of used coffee at your local coffee shop for free. Sprinkle used coffee grounds around your plants to protect them against destructive garden pests like ants, snails, and slugs. Ants are repulsed by the smell of coffee while the slightly abrasive texture of the coffee grounds can be irritating for soft bellied pests like slugs and snails. Similarly, you can also soak your used coffee grounds in water overnight to extract more of that coffee goodness, then strain out the grounds and use the weak coffee liquid as a foliar spray. The spray will have antimicrobial properties and will help to repel many insects, particularly caterpillars. It is thought the smell or flavor of the coffee acts as a deterrent to many critters. If you grow azaleas, hydrangeas, rhododendrons, camellias, roses, or other acid-loving plants, then used coffee is the fertilizer for you! Mix your old grounds with dead grass clippings, brown leaves, or dry straw to neutralize some of the acidity, the spread them around your plants. Used coffee grounds add nitrogen and potassium to the soil (the first and third numbers in the fertilizer formula: N – P – K) as well as a boost of magnesium which all plants need to stay healthy. Hydrangeas are one of the most beautiul plants to grow in your garden, but they can present themselves in many colors from bright blue to bright pink. The color is dependent on the pH of the soil. Alkaline soil produces pink flowers while acidic soil yields blue hydrangeas. Adding coffee grounds to your soil acidifies your soil and can help to turn your flowers from pink to blue. If you don’t have a use for coffee ground fertilizer right away, go ahead and throw it on the compost heap. Coffee grounds make excellent “green” matter as they are rich in nitrogen. Also, beneficial worms may be attracted to your compost with the addition of old coffee. Just be sure to limit the amount of grounds that you add to your pile so that you don’t throw off the ratio of “green” to “brown” matter. If you love carrots and you love coffee, then you’re in business! Your carrots will love you back if you share your old grounds with them at planting time. Before you sow carrot seeds, mix them with some old dried coffee grounds to give them an energy boost right from the get-go. You’ll get bigger and better produce with the added bonus of deterring pests that want to eat your carrots before you do. Five Gallon Ideas presents a brilliant way to grow your own Oyster mushrooms with a five gallon bucket full of coffee grounds. You’ll need a lot of coffee grounds for this project so you’ll probably want to pick some up from your local coffee shop. 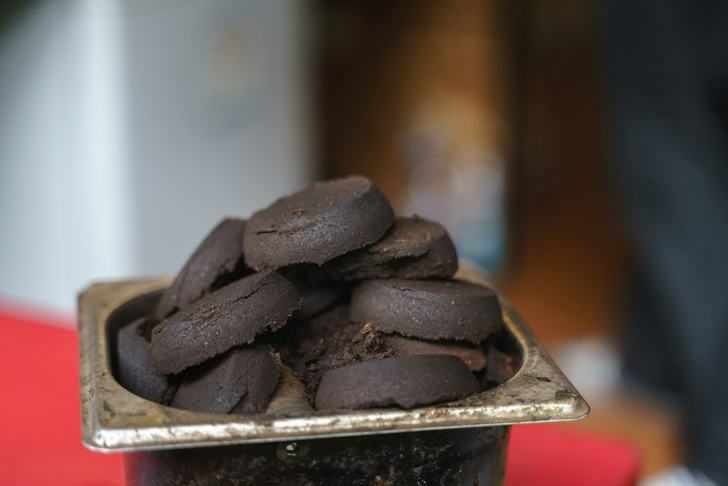 Here are some more brilliant ways to recycle old coffee grounds in your garden. Used coffee grounds can be used much like baking soda for absorbing food odors in the refrigerator and freezer. Just load up a small open container with your old grounds, place it in the back of the fridge, then forget about it for a couple of weeks while you collect more grounds. As an added bonus, after you remove smelly old grounds from the refrigerator or freezer, you can then toss them on the compost pile or use them for fertilizer as described above. Sprinkle old coffee grounds onto an old cleaning cloth and use them to scrub away stuck-on food from counters or dishes. While used grounds are abrasive, they aren’t so harsh that they will damage the surfaces in your kitchen. Just be sure not to accidentally scrub grounds into cracks where they might leave behind stains! If you’ve ever spilled coffee on a white shirt, you know the “Beautiful Golden” color to which I am referring. Turn that pesky coffee stain around and use it to your advantage. Re-wet old coffee grounds and use it to dye everything from feathers and cloth to Easter eggs. Used coffee grounds soaked in a bit of water can also be used to turn boring white paper into ‘antique’ parchment. Here’s the How-To. This faux parchment can then be used for all kinds of arts and crafts including some very interesting and beautiful gifts! If you love the smell of coffee, why not turn your old grounds into all-natural homemade candles? No, used coffee grounds won’t do all of the work for you. However, they will make the process of cleaning out your fireplace much easier and less messy. Gently scatter old used coffee grounds over the ashes to weight them down and prevent the huge clouds of smoke that often arise when performing this arduous task. Not only will shovelling the ashes be easier than ever before, you also won’t have to wipe down every horizontal surface in the room when you’re done. Coffee grounds make an excellent exfoliating body scrub. Just add used grounds to a bit of warm water or your favorite all natural oil – such as coconut or sweet almond. Then scrub your skin from head to foot to remove all of those dead skin cells. Just as it works as a body scrub, coffee makes an excellent facial. Mix two tablespoons of used coffee grounds with an equal amount of organic cocoa powder. Add three tablespoons of whole milk or heavy cream and top it off with a heaping tablespoon of honey for the perfect all-natural alpha-hydroxy and antioxidant facial. Caffeine, when applied to the skin, is anti-inflammatory which helps to reduce swelling. This makes coffee an effective puffy eye reducer. Simply mix some used coffee grounds with a teaspoon of coconut oil and a few drops of water and carefully rub below your eye – making sure not to get any in your eyes. Allow to sit for five minutes and then rub away with a soft damp cloth. Alternatively, try this Homemade Coffee Under Eye Cream recipe. Poor diet, frequent or extended periods of sitting, smoking, or genetic predisposition – cellulite has many causes and for every cause there are at least a dozen “cures” which may or may not actually work. Well, here’s one that does: used coffee grounds. There are hundreds of recipes online for cellulite-reducing coffee scrubs. However, a simple mix of used coffee grounds and warm water will also do the trick. Use this scrub for ten minutes twice per week on any areas affected by cellulite. A 2008 study in Sao Paulo found that topical application of caffeine reduced cellulite fat cells by 17%. Caffeine, when absorbed through the skin, acts as an anti-inflammatory to reduce puffy eyes, it stimulates blood flow which can aid in the production of collagen and it can draw water out of fatty cells, reducing the appearance of cellulite. The multitude of caffeinated soaps available around the internet are testament to how well it works. For an all-natural alternative, why not turn your old coffee grounds into homemade soap so you can get one more good caffeine kick in the morning before work? Here’s the recipe. If you use a lot of hair styling products, or if you’ve recently switched to a natural shampoo and conditioner, your hair is probably weighted down by residue. Remove that build-up using old coffee grounds to give your hair a lift and restore its natural healthy shine. Before you shampoo, simply grab a handful of used grounds and massage them into your hair. The coarse texture is enough to break apart the product residue, but it’s also gentle enough that it won’t damage your locks.